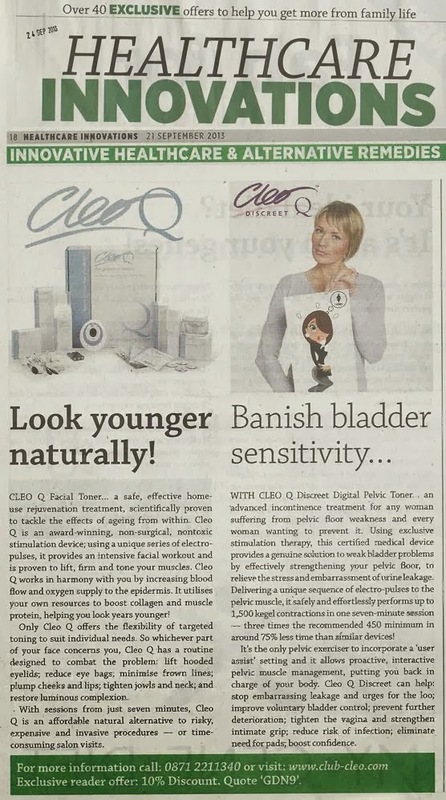 Cleo Q Facial Toner and Cleo Q Discreet Pelvic Toner were featured in the Healthcare Innovations supplement of the Guardian on Saturday 21st September. A safe, effective home-use rejuvenation treatment, scientifically proven to tackle the effects of ageing from within. Cleo Q is an award-winning, non-surgical, non-toxic stimulation device; using a unique series of electro-pulses, it provides an intensive facial workout and is proven to lift, firm and tone your muscles. Cleo Q works in harmony with you by increasing blood flow and oxygen supply to the epidermis. It utilises your own resources to boost collagen and muscle protein, helping you look years younger! Only Cleo Q offers the flexibility of targeted toning to suit individual needs. So whichever part of your face concerns you, Cleo Q has a routine designed to combat the problem. With sessions from just seven minutes, Cleo Q is an affordable natural alternative to risky, expensive and invasive procedures or time consuming salon visits. With Cleo Q Discreet Digital Pelvic Toner… an advanced incontinence treatment for any woman suffering from pelvic floor weakness and every woman wanting to prevent it. Using exclusive stimulation therapy, this certified Class II a medical device provides a genuine solution to weak bladder problems by effectively strengthening your pelvic floor, to relieve the stress and embarrassment of urine leakage. Delivering a unique sequence of electro-pulses to the pelvic muscle, it safely and effortlessly performs up to 1,500 comprehensive kegel contractions in one seven-minute session — three times the recommended 450 minimum in around 75% less time than similar devices! It’s the only pelvic exerciser to incorporate a ‘user assist’ setting and it allows proactive, interactive pelvic muscle management, putting you back in charge of your body.